The Madison River Negotiated Rulemaking Committee moves forward…sort of. ENNIS — There’s no mistaking what this town is about. Turn left at the metal statue of an angler in a cowboy hat hooking a trout. Follow Main Street and pass three fly shops, and in between them the businesses that rely on their clientele. Once the storefronts end, cross the Madison as it passes under the highway, lined by thick snowbanks as March inches toward April. 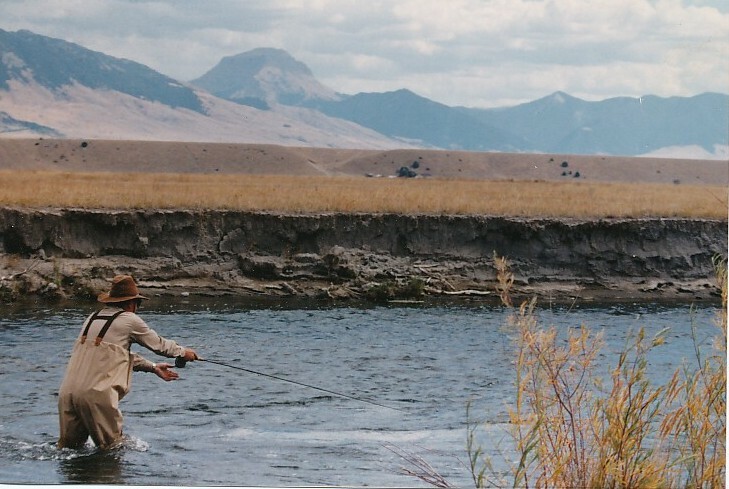 This town lives on that river, one of the most famous fly-fishing destinations in the world. It brings people to town. Fishing guides and outfitters help open those people’s wallets. The ones who don’t hire guides spend money, too, helping provide this town with enough income to eke through the winter. That’s why so many people worry about any new rules or limitations on the river. The venue for that worry of late has been the Madison River Negotiated Rulemaking Committee, a 10-person panel the state of Montana tasked with proposing regulations to ease crowding there. The river topped 207,000 angler days last year, becoming the first waterbody in Montana to crest 200,000, according to Montana Fish, Wildlife and Parks, and use has been increasing for years. The committee hasn’t finalized any ideas yet, but they’ve talked through a few in public, which has been more than enough to rile people here. John Way, owner of The Tackle Shop, said that’s because any limits on outfitters or anglers will affect the number of people who walk down Main Street. Many outfitters have said they’re not flat-out opposed to a cap, but not knowing how it would be done is uncomfortable. “There’s a lot of uncertainty, and uncertainty is sometimes worse than having a direct answer,” Way said. At times, the uncertainty has turned vitriolic. The anger has almost entirely been directed toward the Madison River Foundation, which has backed ideas unpopular with many anglers. Lauren Wittorp, executive director of the foundation, has received most of the criticism. She has been accused of siding with wealthy landowners over public access, of dismissing public opinion, of having no respect for guides and outfitters. None of those perceptions are true, she said, and have all come from some statement or action being taken out of context during the committee’s talks over the past few months. Wittorp, who grew up in Michigan, joined the foundation in 2017. She has been fly-fishing for as long as she can remember, with plenty of time spent on the Madison on family trips. It’s her favorite river. “I love fly-fishing. It’s my favorite thing in the world. And protecting the place I love most is incredibly important to me,” Wittorp said. Her tenure at the foundation began with work on identifying projects in riparian areas around the river, creating a sort of master plan for about 20 projects. The foundation was also part of a land deal in the Madison Valley that will open new public access along the upper river, and it’s working on improving access at the famous Three Dollar Bridge. But her work on the rule-making committee has superseded those, becoming her most high-profile focus. The committee was formed after the Montana Fish and Wildlife Commission rejected an FWP recreation plan that would have capped outfitter numbers and barred boats from the stream’s two wade-only sections, among other things. Wittorp didn’t think that plan was perfect, but she liked parts of it. But outfitters opposed it en masse, saying it was unworkable and wouldn’t address crowding. The commission agreed with FWP that something should be done, so it formed the committee. Wittorp and one of her board members, Campfire Lodge owner Jim Slattery, were named as members. There are also three fishing outfitters, one of whom is the director of the Fishing Outfitters Association of Montana. A non-fishing outfitter, two unaffiliated anglers, a commissioner and an FWP official round out the group. Meetings started in January, and the early goings were slow. But some of what Wittorp hoped to see was already out there in the form of FWP’s proposal, and it has drawn considerable ire — particularly a prohibition on boats in the river’s wade-only sections. The Madison has two such sections — one from Ennis to Ennis Lake and one from Quake Lake to Lyons Bridge, near where the West Fork Madison flows into the main river. Fishing from inside a boat is banned but anglers can use boats to taxi between wading spots. Wittorp believes wade-anglers should have a place to fish without being disrupted by boats, just like hikers can select trails where mountain bikes aren’t allowed. A few other committee members like the idea, too, and the panel talked this week about different ways to provide some space for waders to avoid boats — like splitting up parts of the week, for example. But many guides and anglers say a boat ban would essentially privatize parts of the river that are hard to reach by wading. Reaching portions of the upper section would require wading through challenging boulder gardens, for example, because the river is flanked by private land. “If we remove boats for angling access up there, we’re going to remove over 90 percent of angling opportunities,” Rosenberg said. Some also see this push as being driven by landowners there who want their own private nirvana. They point to some of the foundation’s board members who own land there, like Jackie Mathews. She and her husband Craig, who ran Blue Ribbon Flies in West Yellowstone for years, disagree with the assertion that barring boats is a push from wealthy landowners there, saying many of them have no problem with anglers accessing the river. They also argue that there’s plenty of wadeable access in the area. Craig still fishes it often, including last week. “I walked in there with snowshoes, and I’m 70 years old,” he said. That idea and others backed by the foundation were also criticized in an online petition that circulated earlier this year, garnering more than 1,600 signatures from all over the world. A guide handed copies of the petition and pages of accompanying comments to the committee members last week, urging them to read the packet. Wittorp said she’d seen the petition and read all the comments. She didn’t want to take the half-inch thick packet home, so she threw it away after the meeting. People saw her do it, and it turned into a Facebook post accusing her of not caring what the public thinks. “I didn’t think about the visual of that per se,” Wittorp said. That’s where much of the heat the foundation has received has come from — the internet. Social media outbursts, Google reviews, blog posts critical of its positions. But there was at least one rumored physical threat reported to police. “I never imagined in anything that I did that threats could come over river regulations,” Wittorp said. There has also been turmoil on the foundation’s board. At least four members have resigned recently, according to two former board members, their decisions driven at least in part because of the river rules. Robert Celecia, who joined the board last year, left earlier this month. He has lived in the Madison Valley for 22 years, and he’s been around the foundation since its start in 2003. He said he feels the group has been hijacked by upriver landowners and is only representing a few special interests and not the foundation’s full membership. “I really think they’ve become an advocacy group,” Celecia said. Wittorp said advocating for policies is part of the group’s role and has been ever since its founding. The group was involved in talks on the same issue in 2012. She added that several qualified candidates are already lined up to replace the members who resigned. She also said the foundation surveyed its members on the rule proposals and heard “overwhelming support” for the ideas it’s advancing. Jackie Mathews backed that up. Chris Gentry, owner of Madison Foods, the town’s grocery store, is one member who isn’t happy. She moved to Ennis from southeastern Montana to run the store in the early 2000s, and she got a quick education on the river’s importance. Summertime success keeps her store open through the dead of winter. She has been a member of the foundation for years, but she’s unsure if she’ll renew. She disagrees with any proposal to cap commercial use, arguing that it’s only a fraction of the river use, and she doesn’t like the positions Wittorp has taken. That criticism is hard for Wittorp to hear. She loves this place, cares about it, and sees her spot on the committee as something that goes beyond simply the interests of the foundation. The tension and drama has existed without any concrete rule proposals from the committee. Everything has been hypothetical, and they’ve yet to formally agree on anything. The process was ambitious — have 10 people meet eight times and come to consensus on the best way to regulate the river. The flashiest fight has been over boats in the upper wade-only section, obscuring complex talks over how best to cap use. State officials hoped a proposal would go to the commission in April, which could allow them to have the rules in place by early 2020. As the process drags on, that becomes more and more unlikely. If nothing is agreed to and the committee dissolves, FWP and the commission would decide how to go forward, according to Don Skaar, a committee member and FWP official. Wittorp would like to see FWP try again. The agency came up with many of the ideas she likes, after all. But she still has some hope for the committee, and she said talks have been positive since the last set of meetings. “I think we’re very close to finding compromise,” she said.